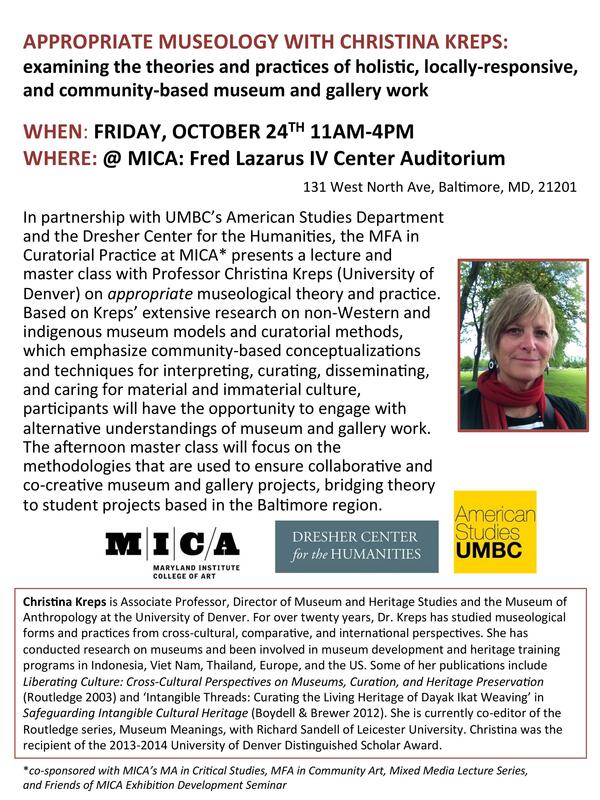 Appropriate Museology with Christina Kreps, a lecture and master class that examines theories and practices of holistic, locally-responsive and community based museum and gallery work, will take place on Friday, October 24 from 11 a.m. – 4 p.m. at the Fred Lazarus IV Center Auditorium at MICA (131 West North Ave, Baltimore, MD 21201. This event is sponsored by UMBC’s American Studies Department, the Dresher Center for the Humanities and the MFA in Curatorial Practice at MICA. Please see the flyer for additional details.